Did you ever stop and think about how often we are told to change our appearance? Magazines constantly offer tips about how to lose weight “in days,” appear slimmer “instantly,” and hide our “imperfections”… without actually knowing anything about us, much less our appearance. This is one example of body-shaming, and it is everywhere. Sitcoms so frequently use overweight characters’ bodies as the basis of many of the show’s jokes. It has become the norm to criticize aspects of our bodies as some type of bonding experience with friends – if we all hate our bodies; it somehow makes us feel connected and united. Body-shaming (criticizing yourself or others because of some aspect of physical appearance) can lead to a vicious cycle of judgment and criticism. Messages from the media and from each other often imply that we should want to change, that we should care about looking slimmer, smaller, and tanner. And if we don’t, we worry that we are at risk of being the target of someone else’s body-shaming comments. 3) Criticizing another’s appearance without their knowledge. (i.e. : “Did you see what she’s wearing today? Not flattering.” “At least you don’t look like her!”). This leads to the question: if it has such harsh consequences, why is body-shaming so common? An example we often discuss at the Braintree Adolescent Intensive Outpatient Program (IOP) is dealing with conflicts with peers. Why, when we are upset, annoyed, or intimidated by someone, do we default to criticizing their appearance? 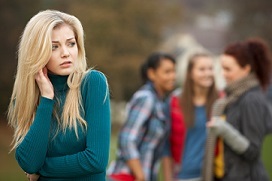 “Whatever, she’s ugly,” can be a go-to defense in these situations, particularly during adolescence and the young-adult years. In some ways, it feels easier to shoot for something that will hurt, like targeting physical appearance, rather than expressing what is really going on emotionally. Saying, “I’m really hurt by how my friend treated me,” or “I’m terrified of losing this friendship” opens us up and makes us more vulnerable, and therefore feels easier to bury underneath the body-shaming comments that rush to mind. How do we challenge this? In situations like those listed above, expressing true feelings rather than physical criticisms can be a great first step. While recently discussing this with the Adolescent IOP, several patients admitted that it is hard to identify ways of expressing frustration without using body-shaming, as this has become an almost automatic response. Practice identifying why you are upset about a situation. For example, it’s unlikely that you’re mad at a friend because she’s breaking out, and more likely that you’re upset about a miscommunication or feeling of rejection. Practice thinking it, and eventually, verbalizing it. Find something (or things!) you LIKE about your body. We spend so much time witnessing advertisements about how to make our eyelashes millimeters longer and how to get whiter teeth that it’d be nice to counter some of that by celebrating what we do have. Maybe, despite your body image struggles, you love a new hairstyle you discovered. Maybe you’ve noticed how much stronger you feel with balanced eating. Find something physical or nonphysical that makes you YOU and celebrate it every day. Is body shaming an issue you encounter? If so, there’s help. Erika Vargas, MA, is the Adolescent IOP Clinician at the Walden’s Braintree clinic. She is trained in the Maudsley Method/Family Based-Treatment (FBT); and works with adolescents to decrease eating disorder behaviors with the support of their families. This is a great point you bring up. The concept of body-shaming can be confusing, especially when combined with conversations about medical concerns. Obesity can certainly be a concern, and that is based on someone’s medical information, being overseen by a doctor. Discussing sugar possibly contributing to various medical presentations sounds like it comes from a place of medical concern, rather than stating that sugar consumption leads to people being fat and therefore deserving of negative attention. Therefore, it does not sound like body-shaming in this context. Doctors often have to discuss medical consequences of obesity, weight gain, etc. This feels very different than someone putting down another person for being overweight, or for something else related to their appearance. I think in any case, the most important thing is to hold both sides of an argument. For example, consuming sugar is often done in a very healthy way, and can be considered an important part of an overall healthy lifestyle. If someone does not allow themselves to eat certain foods containing sugar, it is possible that they are thinking in a very rigid, black-and-white way. On the other hand, consuming excess sugar can also have negative effects on both physical and mental health. As long as audiences are receiving both sides of the story, this feels like a valid point to bring up. I hope this helps. Please let us know if you have any concerns! I am a 30 year old female who – despite weighing less than many people I see on the street every day – am constantly being fat shamed by strange men over my thighs. Admittedly, my thighs are larger in proportion to the rest of my body, but I don’t see why that’s anyone else’s business or why it’s such a big deal, and I have to be told I’m fat several times a day. Actually, according to my bmi, at 5″3 and 119 pounds I’m on the leaner side of normal, but because of the hurtful comments these men make everyday I can’t accept the way that I look. I’m obsessed with toning and slimming down my thighs and I worry that these people have already caused a dysmorphic disorder in me. Hi, just be thankful that you are healthy and accept yourself the way you are. Anyone who says ugly things about you is not worth your time. I am 42 years old and same height as you are. The last time I was weighing under 130 was 24 years ago. I am married and I encounter body shaming on a weekly basis. I am trying to eat right and loose weight but only for my benefit; because I do not want to die young. I’m glad you stumbled upon this blog post! Body-shaming never feels good for the person who is the victim of it. One thing to consider is that often, we interpret what people say differently than how they mean it. I, of course, do not know the context of what the men say to you, but it may be worth considering text versus sub-text. I would also encourage you to consider discussing your dysmorphia with a therapist trained in Cognitive Behavioral Therapy to help you reframe some of the negative things people have said to you, and begin working toward acceptance. I have a student who has accused our administration of body shaming because they do not allow leggings with tops that cover their bottom. I find this insulting to true body shaming and the repercussions it has cost many. Do you find this dress code to be a part of body shaming? Thank you for taking the time to read the blog! I think you and your student both raise interesting points. I have heard similar sentiments from adolescents in our programs, as leggings with tops has become a style over the past few years. Some people feel that, by not being allowed to wear this style, they are being told their body is distracting to others, as if they should be ashamed for the idea of having a body and wearing certain attire. It is hard to say whether this is in line with the same type of body shaming written about in this blog, though what is more important is finding ways to make people feel comfortable in their own body – regardless of their shape, size, or clothing choices. I am doing a research paper on body image shaming and I would like to know the date that this was created, so I can site this source. HI KK, you can say that it was created in February of 2016. Thank you for using us as a source for your paper! Good luck! I am just wondering if someone could give me some good websites or blogs on thin-shaming? I need it for a 5 minute speech on conflicts and stuff. Thanks! Hi Momo, we have a blog, located here ” https://www.waldeneatingdisorders.com/thin-shaming-why-its-just-as-bad-as-fat-shaming/ on thin shaming. I would urge you to take a look at it. Also if you Google “Thin Shaming” the first 3 that pop up are from reputable sources like Huffington Post and Guardian and they tend to have well-written pieces. I’m really sorry you experienced that, Tia. I hope that you know that you are beautiful just the way you are, and don’t feel like you need to change for anyone but yourself. We are all built uniquely different, and that is a gift. Keep on being YOU, Tia! Please take care. I have a problem with comments like how gorgeous someone is and they are bone thin ! My brother in laws wife constantly flings this at me any chance she gets! Long after, finding I was diabetic for ten years before getting treatment! Endo telling me I was high normal thyroid with my weight topping 309! Only to find after losing my thyroid and put on thyroxine I lost 85 lbs.! Well sometimes comments hurt, like tv doc’s calling fat” blubber” while trying to “help” people, it’s judging someone by the content of one’s skin rather than the content of one’s heart and mind that causes strife and sickness in this world. Great points, Rose. We are sorry to hear that you were unable to receive proper medical treatment due to an apparent lack of understanding from your medical team. We are glad that your health seems to be under control, and that your realize that judging people by their external appearance is doing them a world of injustice. I’m over weight and middle aged. My husband told me to go put my “apparatus” on (meaning my swimsuit) so we could get in the neighbors pool. She is young thin and was wearing a bikini. I told him that his statement hurt me and was insulting. I feel like it’s body shaming. Am I wrong? I’m sorry this happened to you Carla. It’s hard to understand why people do an say things sometimes. It sounds like you handled it well though. Good for you for expressing you’re comfortable with you’re nose but that you were bothered by her comments. Communicating your feelings is so important. I agree that it’s never okay to put down others for physical features or whatever it may be, but it unfortunately happens. And when it happens, it does not feel like a joke! Hopefully the way you handled the situation will cause her to reflect on her words and actions and do a little soul searching. It would me. I can relate as a male. I was mercilessly teased about being fat. I refuse to sink into a victim status however and have no wish to crusade about the issue and to make it an ideological cause celebre. I was also teased about my nose. Screw them is what I decided and moved on. It’s their issue.Weight is health issue only. One should never let others dictate how we should feel about ourselves. We who were taunted by our weight or by any physical quality must move on and discover things about us that trancend the ignorant opinion of others. Be strong. You are a child of God who accepts you as you as you are. If you are good enough for God you are good enough for you. I am 23 yrs old female. My mother and father feels awkward to take me out with them because im overweight and my mom even said to me about this. I feel helpless . I don’t know how to react to this. I even argued with her saying physical features dont matter and she said that it matters for her. Relatives and friends around have been asking about my plus size and she feels awkward to face them because of me. My daughter is 9 years old and just starting to “blossom”. The school has now twice approached us to tell us she needs to wear and undergarment of some type because others are noticing. This is mostly because the weather is turning colder outside. Today, the assistant principal told my husband that my daughter must wear a coat. I have had conversations with kiddo, but she is not ready to wear a bra. Her classroom is hot and she runs hot all day as is. She does not want to wear a tank or cami for fear that it will make her hotter. I feel that the school is overstepping their boundaries and that this is total body shaming. Do you have any words of wisdom that I should say to the school. Or should I just force my daughter to wear some type of undergarment? I think us ladies really perpetuate this body shaming issue,by agreeing with what the media calls attractive,beautiful etc. Who cares if the whole world says you are beautiful.We depend on men’s approval of us,to the extend that even those ladies who are not even overweight to the extend that their health is at risk are trying to loose weight. I believe everybody is beautiful in their own way. I’m a senior and since menopause I have struggled with my weight. I attend W.W. and do my best. I have a close relative, older than I am, who has always been thin although she bakes and eats whatever she likes. She constantly makes comments about weight every time I ever talk to her. She told me she was disgusted her daughter who is about my height because she was so heavy. I asked about how much she weighed and she said about 170 pounds. That means she finds me disgusting since I struggle to weigh 170 pounds. I’ve told her I find her comments hurtful but she can’t speak to me without weight coming into the conversation. Perhaps this is her power trip. Any suggestions. I hate to burn bridges at this age. Ironically this same woman had a granddaughter who was hospitalized and very ill with anorexia so you’d think she’d know how hurtful it is. Thank you for sharing your comments. I am sorry to hear that you are having a hard time with your relative. It sounds like she puts a lot of stock into weight as a measure of someone’s value. Unfortunately, we can’t force people to change, especially if this is belief that this person has had for a long time. It is totally appropriate for you to limit exposure with this relative, especially if you have asked her to stop as it makes you feel uncomfortable. I would also encourage you to look into the body acceptance / health at every size movement for tips on how to appreciate the body that you’ve been given for the amazing things that it does. I am just curious as to whether or not it is socially acceptable and/or common for people to comment on another person’s weight? I know it happens but it seems bizarre and extremely presumptuous for someone to comment to another that a. they’ve gained weight (unless they know them well and the person is trying to gain weight) b. they’ve lost weight (again would have to know person well and know this is a goal). I would never tell someone, “You have put on some weight” or “You are too skinny”. So I was searching to see what type of person would do this and what their clearly negative ulterior motive might be.